SilencerCo announces the latest addition to their Summit™ line: the limited-edition Blackout package featuring Rick Hinderer Knives™. Included in this collaboration between SilencerCo and Rick Hinderer Knives is a limited-edition matte black Omega™, 3.5” Hinderer XM-18 folder with Omega styling, and a case of black nickel-plated SilencerCo Harvester™ 220 grain Sierra MatchKing™ subsonic 300 Blackout ammunition - all contained in a custom wooden display case. The Omega is full auto rated and is the lightest, quietest, and shortest .30 caliber suppressor on the market. Specially configured for the Summit line, this particular Omega features a matte black finish, ASR™ quick detach mount, Flat Front Cap, and includes a Specwar Trifecta™ Muzzle Brake. Known as one of the most respected knifemakers in the United States, Rick Hinderer designs are highly sought after by collectors the world over. His attention to detail and quality, paired with very limited production, has created a cult-like following. 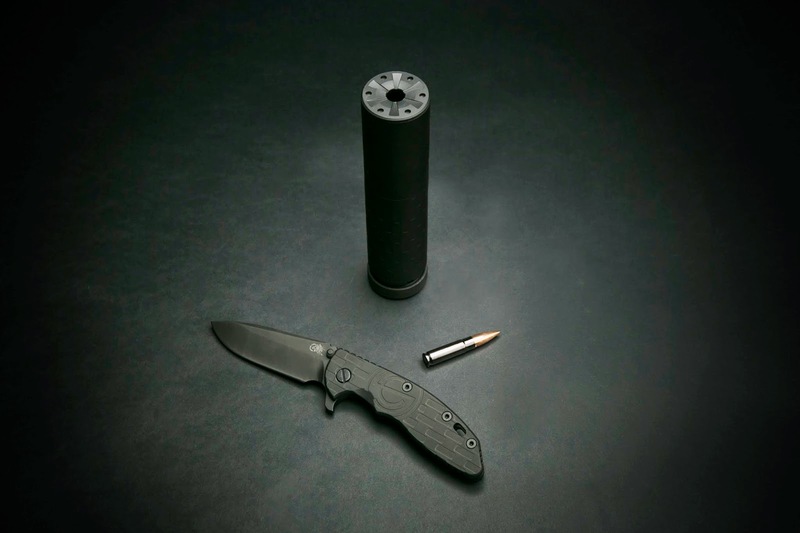 What makes this SilencerCo Blackout knife unique are several features including an ultra-durable DLC finish, titanium frame and scale, and SilencerCo styling - details chosen to reflect key features of the Summit-edition Omega. The Blackout package will be the first time that Hinderer has partnered with a company to create a collaboration from the ground up. To round out this package, SilencerCo is including a case of their own black nickel-plated Harvester subsonic 300 Blackout ammunition - making this collaboration a true Blackout package.